Terry Blackwood of The Imperials signing my copy of Aloha From Hawaii Via Satellite. 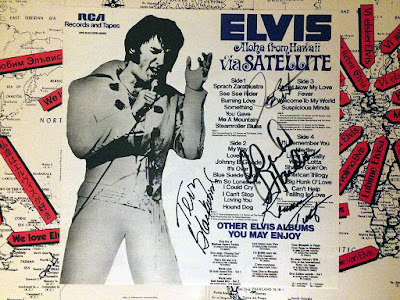 On this date, 44 years ago, Elvis performed his historical Aloha From Hawaii Via Satellite concert. 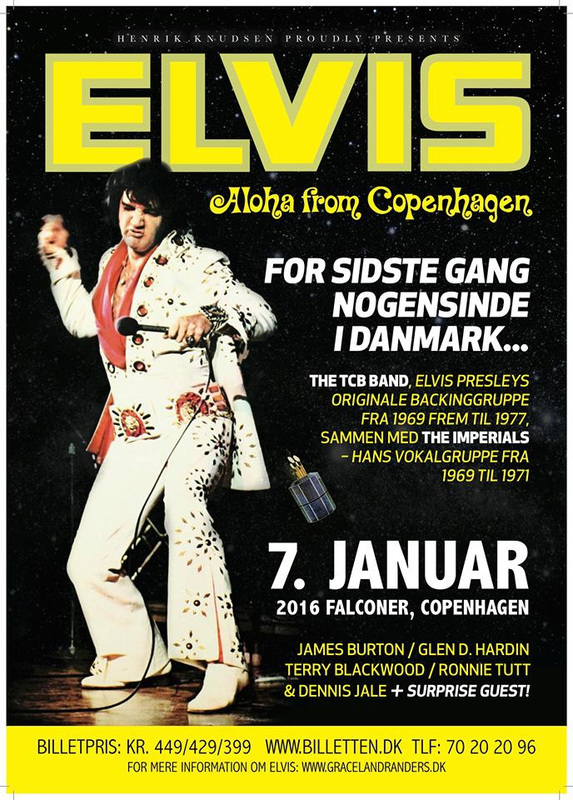 Last year, on nearly the same date, January 7, three musicians who shared the stage with Elvis when he made his global telecast played another show, this time in Denmark. 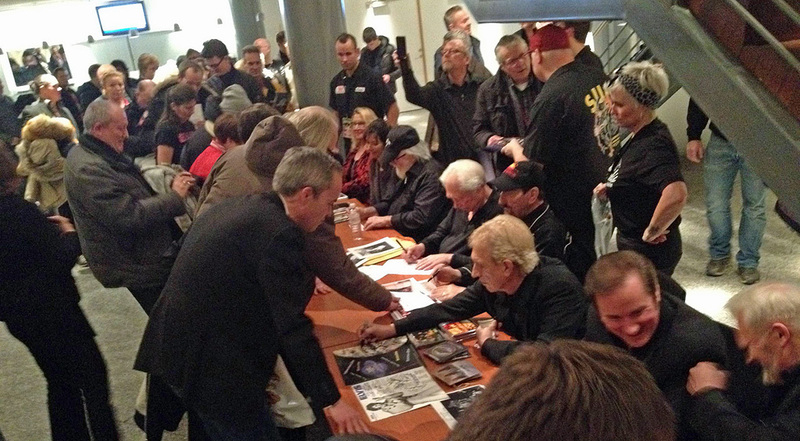 Some 1 700 fans then celebrated Elvis´ 81st birthday with James Burton, Glen D. Hardin and Ronnie Tutt. Also present on stage during this Aloha From Copenhagen show was Terry Blackwood from the Imperials and Austrian singer Dennis Jale. Poster for the Aloha From Copenhagen concert. Living in Sweden means Denmark isn't that far away, especially when you are traveling from the southern part of the country. 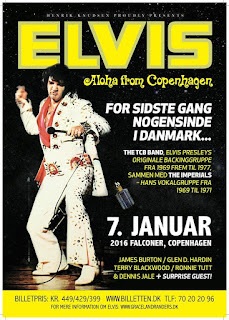 So when me and my brother, who is also a huge Elvis fan, heard about the upcoming event in Copenhagen, we decided it was something we couldn't afford to miss. I remember it was raining pretty hard when we left the train station and headed towards the Falconer Centre where the show was to take place. I also recall we had trouble finding the place and practically stumbled across the back of the building, from where we could hear the band rehearsing inside. Quickly locating the entrance and walking inside we found ourselves in the company of hundreds of fellow Elvis fans. And there was excitement in the air, maybe a bit like the real thing in the 70's, when people who shared the love for Elvis and his music went to see him in concert. As for the show itself, it was an enjoyable evening. Having had the privilege to see the TCB Band on stage during a couple of "live on screen" concerts from 1999 to 2012, it's obvious the band members are getting older, but there was no mistaking the fun they had playing for the fans. This was especially evident watching Glen D. Hardin, who was hammering away on his keyboard with a smile on his face during the whole show. And James Burton got to play a lot of solos in songs such as "See See Rider," "That's All Right," and Johnny B. Goode," to the delight of the audience. Terry Blackwood of the Imperials also brought a lot to the show together with the other two members of The Imperials. Looking back, some of the highlights included "An American Trilogy," "Suspicious Minds" and "Polk Salad Annie". A nice surprise was "Change Of Habit" which sounded great. Tha autographs of James Burton, Glen D. Hardin, Ronnie Tutt and Terry Blackwood. But the best part of the evening was after the show, when the musicians and singers signed autographs. A lot of fans had brought with them records for this occasion, and I was no exception. I thought my choice was perfect, an original copy of the double LP Aloha From Hawaii Via Satelllite with a separate insert listening the songs of the concert. 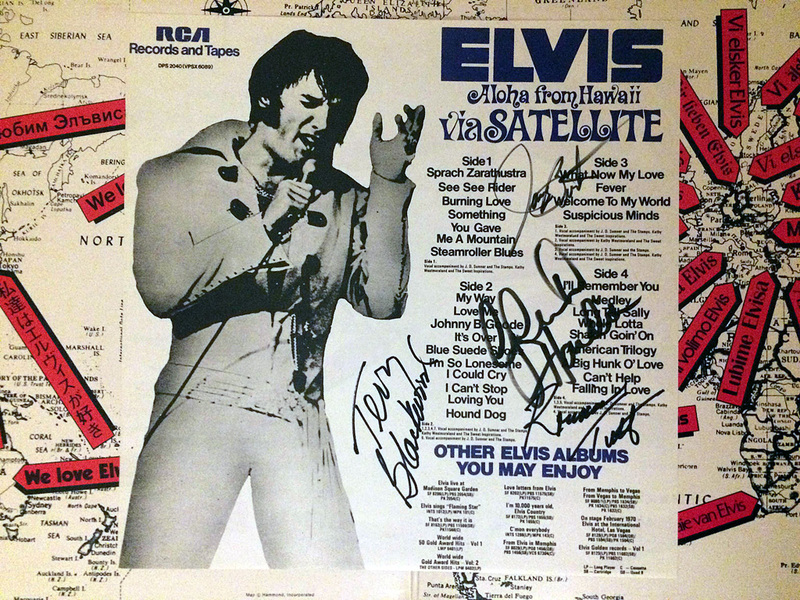 James Burton, Glen D. Hardin, Ronnie Tutt and Terry Blackwood signed the back of the cover as well as the insert, and I also had the chance to change a few words with each of them. Carefully protecting the album against the rain, me and my brother headed for the station and the train home to Sweden. Granted, Aloha From Copenhagen wasn't as historical a moment as Aloha From Hawaii, but in a way it was for us. It was probably to be the last time we attended a concert with the TCB Band. What a fantastic piece to add to your collection, not to mention experience. How were the lead vocal portions handled? Was that where Dennis Jale came in? So great to see you posting again! Hi Troy, it was a great night! Yes, it was Dennis Jale who sang lead, and he did all right. His vocal range was more limited than Elvis', maybe that's why he stayed away from the 50's stuff. I liked that he didn't try to sound or look like Elvis. I also have to add I'm happy to have a brother who likes Elvis as much as I do, it's always more fun to share an experience like the one I wrote about. And thank you for your last comment, I suddenly felt I wanted to write about Elvis again.